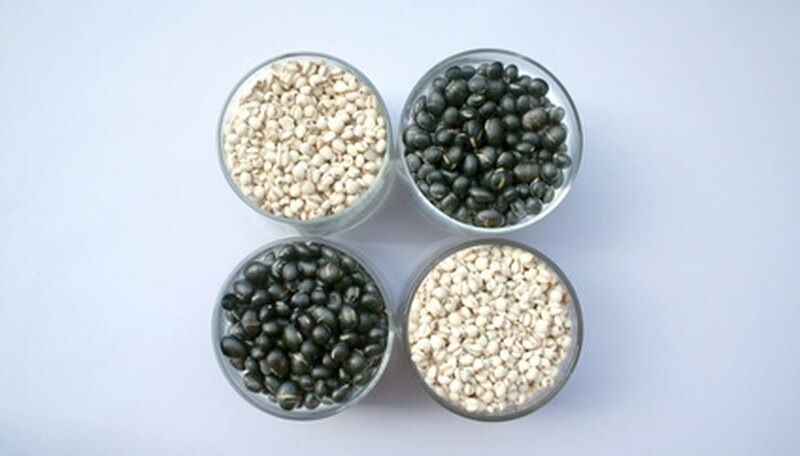 Beans are highly nutritious, containing protein, iron, potassium, magnesium, manganese and vitamins A, C and K. Knowing the structure of bean seeds enables growers to understand the importance of regular, even watering and the growing process. Bean seeds are fascinating in their simplicity. Despite their simple structure, bean seeds produce vast quantities of foliage and fruit. The testa is the hard, protective outer layer of the bean seed. Although the testa is thin, it is very tough. The testa varies in color, depending on the variety of bean seed. There is a very small hole in the testa, known as the micropyle, which allows water to enter and begin the germination process. Cotyledons are the two halves of the bean seed, covered and protected by the testa. The cotyledons provide the developing plant with nutrients and help sustain it until the roots begin to mature and are able to absorb sufficient nutrients to sustain the plant. As the nutrients stored in the cotyledons are used by the growing plant, they shrivel and dry out. The radicle is one half of the embryo, which is situated between the cotyledons, inside the testa. The radicle is the first root produced by the seed. Once water reaches the embryo and begins the germination process, the radicle pushes down through the micropyle and into the soil. The radicle continues to grow until a fully-fledged root system has developed and is able to sustain the growing plant. The plumule is the second half of the embryo, and produces the first leaves of the plant. After the radicle breaks through the micropyle and begins its descent into the soil, the plumule swells, pushing up through the testa and soil until it reaches sunlight. The hilum is situated on the testa, at the indented part of the bean seed. The hilum is a scar where the bean seed was previously attached to the pod. The micropyle is situated in the hilum. The hypocotyl is part of the stem, between the cotyledons and the foot. The hypocotyl follows the plumule and cotyledons up through the soil toward sunlight. The epicotyl is the part of the stem above the cotyledons and below the plumule. As the bean seedling develops, the epicotyl grows and elongates in a process known as phototropism, which means growing toward the light.